I’ve tried to squeeze all the main ideas of the work disability prevention (WDP) model into one page (see below). The model has matured over the last several years as key dynamics have become more apparent. I’m curious to hear your reaction to this new version. After promoting the WDP model in the private sector for a long time, I started introducing it to the Federal / State disability sector in 2011. Now seems like the right time to get a compelling and very succinct document circulating so it gets in front of many more eyes – for example, lots of eyes on Capitol Hill and in regulation-creating / law-making (sausage making) circles. The members of the Work Fitness & Disability Roundtable are also helping me craft a 3 or 4 bullet “sound bite.” However, in my view it will take more than that to get influencers and decision-makers to decide to explore these issues further. They need a quick summary of WHAT the problem is, WHY things look the way they do, and WHAT might be possible instead — but just a bit. Thus, this one-pager. I’m not yet clear what to do with this draft – other than to post it here and solicit your comments. Am also hoping to get your ideas for the best organization to issue and disseminate a manifesto like this — so it has the maximum impact. What are the chances of it going viral? Please leave a comment below or email me your ideas and suggested revisions. Preserving people’s ability to function and participate fully in everyday human affairs, including work, is a valuable health care outcome, second only to avoiding loss of life, limb, and essential bodily functions. Loss of livelihood due to medical problems is a poor health outcome because worklessness is harmful to people’s health as well as their personal, family, social, and economic well-being. A new medical problem that threatens the ability to continue earning a living is a big challenge – a life crisis that must be addressed. Most people are unprepared, never having faced this double-headed predicament before. It can overwhelm their coping abilities. When medical conditions occur or worsen, especially common health problems, most people are able to stay at or return to work without difficulty because the right things tend to happen during the first few days or weeks. However, many of the prolonged work disability cases in both private and public sector sickness programs, disability benefits, and workers’ compensation programs began as very common health problems (for example musculo-skeletal pain, depression, and anxiety) but had unusually poor outcomes. Unusually poor outcomes are frequently due to the interplay of sub-optimal health care and non-medical factors. Without a team focused on helping them get their lives back on track, people can get lost in the healthcare and benefits systems. Remediable issues in the situation are overlooked and not addressed. Incentive alignment among the involved parties is poor. Medical conditions by themselves rarely require prolonged work absence, but it can look that way. And with every passing day away from work, the odds are worsening that people will ever return to work. After a while, they start to see themselves as too disabled to work. Unlucky people lose their job and do not find a new one. They leave the workforce and eke by on disability benefits, in poverty, and vulnerable to its detrimental effects. Today, most professionals typically involved in these situations (healthcare professionals, employers, and benefits handlers) do not feel responsible for avoiding job loss. Good scientific evidence exists about how unusually poor outcomes are created, how to avoid them, and the health care and other services that can optimize function and protect jobs. When work disruption begins, it is both effective and cost-beneficial to have a coordinator assist the individual, their treating physician, and their employer with communications, as well as focus everyone’s attention on restoring function, accommodating irrevocable losses, and making plans for how to keep working, return to work, or quickly find a more appropriate job. Urgent priority should be given to establishing accountability for work disability and job loss as well as building nationwide capacity to consistently deliver services that help people stay at work or return to work – just in time, when needed. Helping more people with medical problems to keep their jobs or find new ones in a timely manner will benefit them and their families, and will benefit our society as a whole. This entry was posted in Articles, Publications, Research, Policy Issues and tagged acquired disability, Federal, job loss, leadership, legislation, system, value of healthcare, work disability, worklessness on March 7, 2016 by Jennifer Christian. Do you realize that NO professional feels responsible when a working person loses his or her job because of a health problem — neither the doctor, nor the employer, nor the person handling the claim for healthcare, disability, or workers’ compensation benefits? At most, the professionals may say “that’s a shame” assuming they are even aware it’s happened. Job loss is often invisible; the person just drops off the radar. The government insists that employers track workplace injuries and illnesses, hospitalizations and fatalities — but no-one is tracking job loss. Among the public purposes of the Americans with Disabilities Act is promoting employment of people with disabilities. The millions of workers now silently disappearing from the workforce due to newly-acquired disabilities deserve more visibility — and more help. An estimated 2.5 million people leave the workforce each year for health reasons, most frequently due to things like low back pain and other common musculoskeletal conditions, as well as the most common mood disorders of depression and anxiety. And none of the professionals who are called on to respond when those individuals start having difficulty are being held accountable for making an active effort to help them keep their jobs. Obviously, some people really can’t continue to work (for example those who have a terminal illness or have suffered an incapacitating injury). But some of those lost jobs COULD have been averted if any of those three professionals had devoted more of their skill and discretionary effort to finding a better solution. In my opinion, this hole in our social fabric through which people with newly-acquired disabilities are falling has been invisible until now — and is unacceptable. To put this in perspective, as Western societies have evolved over the centuries, other kinds of private tragedies have become public concerns. Do you realize that until roughly the 19th century, no one felt responsible when a pregnant woman died in childbirth, or her newborn infant did — which was very common? “That’s a shame,” people said. It was each family’s private tragedy. Today, several professions, many hospitals, and whole departments within public health agencies in every single state focus on keeping pregnant women healthy, providing prenatal care, assuring a safe childbirth, and proper care of newborns. Maternal and infant mortality rates are now considered basic indicators of the health of a country’s entire population — and the adequacy of its public health / health care systems. 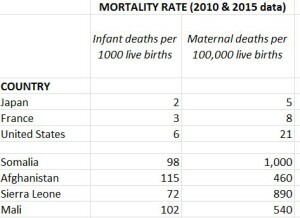 In the developed countries, maternal and infant deaths are 50 to a 100 times lower than the rates in still-developing countries. Here is data from the CIA’s World Factbook. Wouldn’t it be interesting to see a comparable table showing job loss rates for the countries? What do you think it would show? I bet the developing countries are doing less well by comparison — because their social safety nets tend to be weaker. And I doubt workers that in the US are a 100-fold better off. I’ve heard that European countries make it much harder to “throw away” unwanted workers. It is not only important for workers and their families to stay employed. Every time a worker loses his or her footing in the world of work, our society takes a DOUBLE hit: we lose an economic contributor AND at the same time we gain another person dependent on taxpayer funded benefits. I’ve been part of a two-year effort to start thinking seriously about ways to reduce job loss due to illness and injury among U.S. workers while serving as a member of the US Department of Labor’s Stay-at-Work/Return-to-Work (SAW/RTW) Policy Collaborative. This year three of us (economists (David Stapleton, Kevin Hollenbeck, and I) were asked to develop policy papers, each on a specific aspect of the issue. My task was to think about how to establish accountability for job loss among the professionals who have the best opportunity to influence the outcome. I felt so LUCKY to be PAID to take the time to explore this topic in depth — it was really fun to put my “thinkatorium” into high gear. Stimulating conversations with more than 30 experts in various fields and sectors of society helped shape my thinking (thank you all — their names are listed in the report). The final product is three main recommendations and a set of specific suggestions for action — how to accomplish the recommendations. I hope you will read my paper to see where this line of inquiry leads you. I bet you will be surprised — because I was. On October 22, the U.S. Department of Labor’s Office of Disability Employment Policy (ODEP) and Mathematica’s Center for Studying Disability Policy (CSDP) hosted a policy forum to introduce the three policy papers and all of their recommendations. You can view the 90 minute video of the event here. It includes some very good questions from the audience and subsequent dialogue. All three policy papers are available on Mathematica’s website. Please consider joining me in transforming these 2.4 million hidden and all-too-private tragedies per year into a public challenge for change. 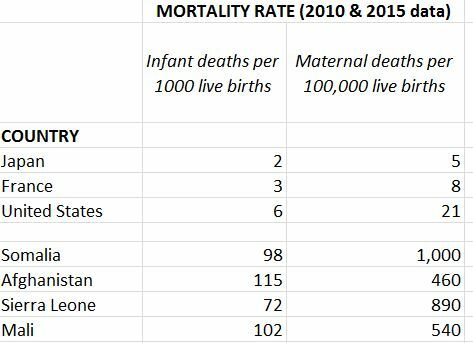 And before you go — did you notice that the data I cited on maternal and child death rates came from the US Central Intelligence Agency’s INFORMATION WEBSITE??? Who knew? I just stumbled on it. This entry was posted in Articles, Publications, Research, Events, People, Organizations & Websites, Policy Issues and tagged accountability, acquired disability, Americans with Disabilities Act, Federal, job loss, leadership, system, work, work disability on October 30, 2015 by Jennifer Christian.